This homeopathic medicine is for ulcus parapyloricum (acidity), heartburn, bad taste, belching and flatulence. 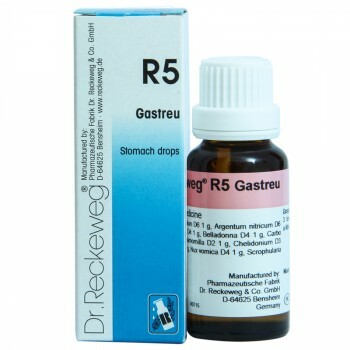 The R-5 Stomach Drops consists of Anacardium, Argentum Nutricum, Arsenicum Album, Carbo Vegetabilis, Chamomilla, Chelidonium, Lycopodium, Nux vomica and Scrophularia nodosa. This homeopathic medicine is for ulcus parapyloricum, heartburn, bad taste, belching and flatulence. It is used for strong gripping pains, and hyperacidity. Take 10-15 drops diluted in some water 3 times a day before meals. Discontinue usage if symptoms persist or aggravate further. Offering the R-5 Stomach Drops 22ml with fast shipping in Karachi, Lahore, Islamabad, Rawalpindi, Peshawar, Quetta and many other cities of Pakistan.